Going to an industry conference, the best you hope for is bringing back one or two really good ideas and a few new valuable contacts for your professional network. Rarely does it become a revelation. Rarely does the content and speakers all combine to paint a stunningly unified, precisely crafted and clear vision of the potential of the future financial professional business model. Of particular note is how a recent High Net Worth (HNW)-focused Conference also, concurrently, delivered a stern cautionary warning about both the power and the inherent legal risks of putting two words together – wealth and management. Such was my experience at the Financial Engineering Institute’s Fall Family Wealth Conference in Orlando a few weeks ago and, hence, the need for this write-up on the Conference. The Financial Engineering Institute (FEI) and its constellation of sister companies and strategic partners, called “expert sourcing firms”, are all carefully chosen and inextricably linked to support financial professionals who want to attract and retain truly HNW families and business owners. Nick Gregory, CEO and Chief Wealth Engineer, of the FEI explained that over his 40 years of working with and building from the full range of needs of his high net worth clients, he mapped out their ten specific areas of need that he refers to as the “financial life support system that surrounds a high net worth family and their businesses”. He then started carefully designing and engineering a comprehensive set of solutions for financial professionals that he states “positions them with an unfair competitive advantage in the HNW marketplace”. “Most wealth management firms and many family offices are just primarily managing investable assets with some concierge services thrown in. When I ask where their revenue stream is coming from, they say 90-95% of their revenue is from assets under management (AUM). There was a survey conducted recently reporting that 87% of wealth management firms are not managing wealth, they are managing the family’s liquid assets. So much focus is put on asset management that the real concern of the survey was the use, abuse and misrepresented and misperceived nature of the term - wealth management. In other surveys conducted with HNW families, you will see that asset management is deemed fifth in importance to them, not first. Comprehensive financial planning is the single most important need they requested, followed by estate planning, tax planning, and legacy planning. So that means most wealth management firms are built in reverse of HNW client needs. Other surveys tell us that 77-85% of the time when the patriarch of a family passes away, the current advisor loses the assets. Those percentages baffled the heck out of me. However, I then realized that most wealth managers are mainly managing liquid assets, which are very easy to transfer to other firms, versus offering a comprehensive wealth management approach. True comprehensive wealth management makes a strong, vital connection across the whole family, especially the subsequent generations, creating a strong epoxy for the wealth management firm and its relationships. “Wealth management malpractice can generate a lot of negative results. The success of true wealth managers is predicated or dictated by taking a broader swath of control in the family’s financial life support system – what we call “wealth engineering”. I fear a substantial increase in lawsuits unless wealth management firms are properly structured and can implement a truly holistic service. That is the goal of the Financial Engineering Institute – to enhance the DNA of financial advisors, law firms and accounting firms, to create an unfair advantage in the marketplace and build an unassailable multi-generational positioning with the HNW family and their businesses. 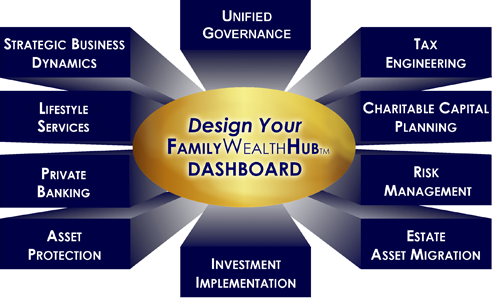 The goal for advisors, as this chart depicts , is to be in the optimal positioning in the center of their client’s Family Wealth Hub. “Every successful American Family has a “financial life-support system” and what permeates around that “system” is a great deal of complexity. We have identified 10 key areas of need for HNW families and their businesses: unified governance, tax engineering, estate asset migration, risk management, charitable capital planning, asset protection, strategic business dynamics, capital sourcing, investment implementation, and lifestyle services. These areas are intertwined and filled with opportunities and pitfalls that most clients are unaware of. Our “Approach Talk”, that we developed, provides an initial presentation for advisors to set the stage and educate HNW clients as true wealth managers in dealing with the financial blind spots of highly successful families. The process couples with a team of “expert sourcing” firms that are specialists in these key areas and are able to deliver high end tools, solutions and products that truly address complex family and business wealth. Advisors can now equip themselves accordingly to brand, position and differentiate around the true needs and goals of HNW Families. Greg Crawford, CEO, Alliance Trust Company – offers turnkey, private-label trust services with extremely favorable Nevada situs for wealth management firm branding - estate migration design techniques coupled with asset protection power tools. James Sekel, SVP, Private Banking, TriState Capital – offers ways to integrate private banking solutions into your practice like securities-backed lines of credit for your business owner clients – flexible, innovative lending solutions. Kyle Gregory, President, Give Back Nation – a 501(c)3 national family community foundation which offers qualified advisory firms the ability to position and brand their own community foundation affiliation anywhere in the country with turnkey planned giving, fund-raising tools and a turnkey private-label donor advised fund. Mark Sims, CEO, Captive Alternatives – provides a private insurance company design that can be built for successful business owners. Jim Convertino, Director, McGowanPAE Insurance – specializes in property & liability risk management for HNW market including professionals, athletes and entertainers. Terry Chesser, Principal, U.S.Advisors – provides innovative self-insurance and reinsurance health care design for businesses and business associations. Walter Cotumaccio, CMO, Reich&Tang – enhanced cash management capabilities. Larry Shumbres, CEO, Totum Risk – FinTech company that provides enhanced investment risk analysis tools. Brent Burns, CEO, Asset Dedication – FinTech financial plan-based turnkey asset management platform managed to a higher standard. Lara Galloway, Director, White Glove Workshops – a cutting edge, digital seminar marketing program for advisory firms. Since the formation of the Institute for Innovation Development, I have steadily been in search of and reporting on off-the-radar examples of financial services innovation in business management, financial technology, money management and creative new client/community engagement strategies in order to build awareness and hopefully inspire new ways of thinking and acting in our industry. This is vital because it is the Institute’s contention that the biggest challenge we have in our industry today is working in a business environment of accelerating change. In our opinion, we feel it is important to spotlight and learn from builders like Nick Gregory and his Institute as they provide great examples of innovative design thinking, new business model creation and creative ways of implementing new technologies and financial strategies into the financial professional model. His organization’s next Wealth Engineering Conference will take place March 24-26 in Orlando.